I believe the book by Donald Bradley "Stock Market Prediction" is the best book about financial astrology. He has done an excellent job, especially taking into account the fact that there were no PC in 1940s. First of all he has demonstrated that astrology really works. Second he has made this fact understandable to all people, not for small astrological community only. Each word in this book has some sense in comparison to many modern sources of financial astrology (where it is sometimes impossible to find any common sense at all). And I simply love his book! In this mini class I want to show how to create models described in this book and then how to enrich them using modern math methods. Let us start with the simplest example. We create the Solar indicator, i.e. the indicator that takes into account aspects of all plants to the Sun. 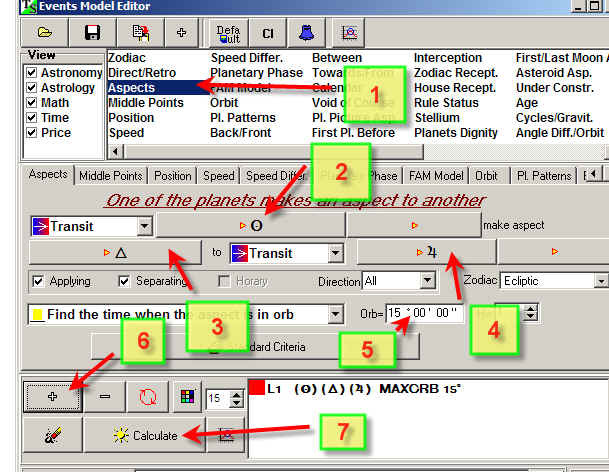 You will get the Model Editor window where you can define easily practically any astrological event. Let it be the event: "the Sun makes a trine to Jupiter with the orb=15 degrees". In practice I use "Synodic Curve" (which is what D. Bradley used) and "Triangle" orb figures, I believe they are the closest to real aspects effect. 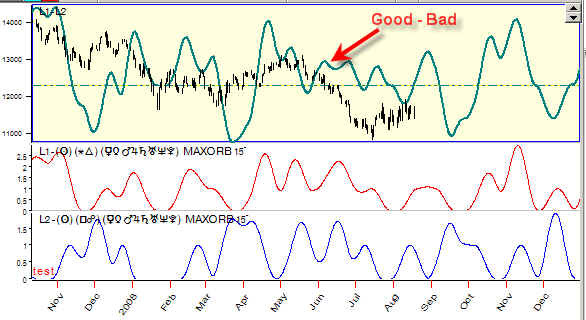 However, it is not Solar indicator yet. Together with the "good" part, we should consider "bad" aspects as well. Thus, our new player in this game sings its song: "the Sun makes bad aspects (square, opposition) to other planets". Now we have two singers on the scene: L1 with its aria about "good" aspects, and L2 who sings about "bad" aspects. Now we need to know the balance between "good" and "bad" aspects. Mathematically we perform subtraction between good and bad aspects. This is how the duet of two singers sounds. We have considered here "good" and "bad" aspects. But - what about the conjunction? This is the strongest aspect, and we definitely should consider it. According to classical astrology approach, conjunction is bad when it involves "bad" planets (Mars, Saturn, Pluto) and good with "good" planets. 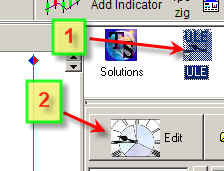 To hide L1, L2, L3, L4 terms and to be able seeing the final indicator only, set "All items" option OFF. 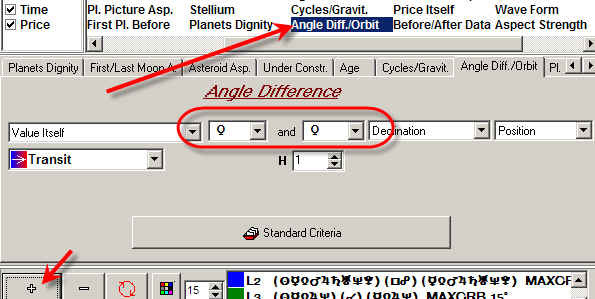 Do not worry, the program will calculate all planetary pairs and gives you the summary effect of all these "good" aspects. Bradley also used the declination factor; he took it as "half of algebraic sum of the given declinations of Venus and Mars". 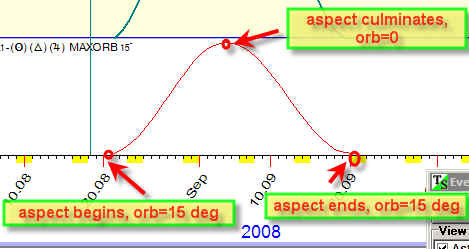 Thus L5 event is Venus declination. 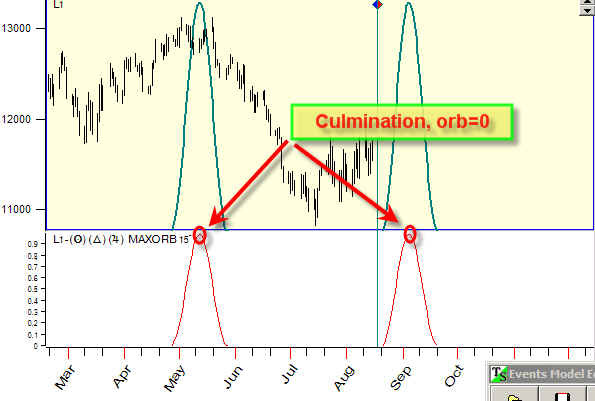 The same way I have created L6 term as Mars declination. I simplified this formula. Originally Bradley considered conjunctions in a special way (see "Valency of conjunctions" table in his book). You can easily reproduce this table creating more terms. Also you can play with final formula varying coefficients, orb for each term to get better projection line. I do it very often. However I believe that we need to apply here other technologies that allow to reveal the most appropriate coefficients automatically. We must to go further. Welcome to computer era! To be continued in the next Class.